Winter finales often make it feel like Christmas came early. Sometimes a jam-packed hour of television makes for the perfect gift. Unfortunately, once the wrapping is undone and the gift is revealed, you're not always left entirely satisfied. A lot happened on Grey's Anatomy Season 10 Episode 12, and I almost feel like it was just too much all at once. Without focus on a number of pivotal storylines, I missed the emotional connection that I'm so used to grasping on to with previous Grey's finales. I know that I won't be alone in saying that this has hardly been one of my favorite seasons, but you can bet I'm in for the long haul. I'd like to think that the first half of Grey's Anatomy Season 10 ended on a relatively good note, as it certainly left me wanting more. However, I can't say that I'm dying to find anything out. This feeling is so different from seasons past. 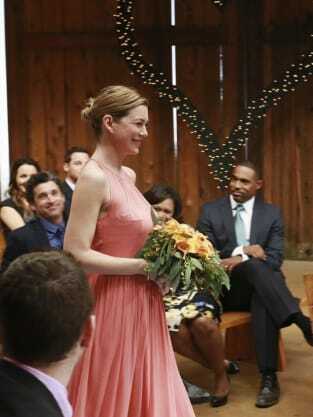 Like most Grey's weddings that don't always go as planned, April's big day was no exception. When I spoke to Sarah Drew, she promised the final five minutes of the installment would be shocking and definitely worth our while. I know I'm in the minority here, but I was really hoping the Mapril wedding would go down without a hitch. Poor Stephanie! Poor Matthew! So, the big question is: What will April do? 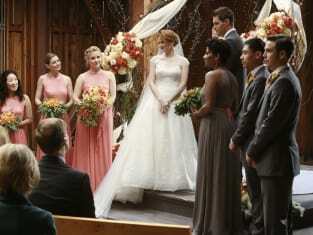 Do you think she'll still go through with the wedding or will she run off with Jackson? Another cliffhanger included Derek and his call from the President of the United States. I love McDreamy and am intrigued by this storyline. I'm just throwing this out there, but what if there was a crossover episode with President Fitzgerald Grant from Scandal? Wouldn't that be awesome?! Lastly, we're left to wonder if Alex's dad is going to be okay. Shane was experiencing flashbacks from the night Heather died and feeling too invincible and thought he was able to save anyone. It's a good thing that Richard showed up to help Shane back away and to hopefully help Alex's dad. Side note: Props to a few people who left comments suggesting that something was seriously wrong with Shane. All this time, I thought he was just being a jerk. Clearly, he was losing his mind and himself without sleep, being hyped up on energy drinks and being haunted still by Heather's death. Aside from the surprising moments, Cristina and Meredith reached new levels of annoying. On one hand, I was glad that they were finally fighting verbally and throwing everything that they had to say out there. Then again, I felt like it was a long time coming... maybe too long. I'm not even sure if they made up or not. Either way, can we please not see them arguing ever again? I get that the staff at SGMW is tight-knit, but why didn't we see April with any of her family members? There wasn't a single scene with her talking to her parents or even her sisters again. 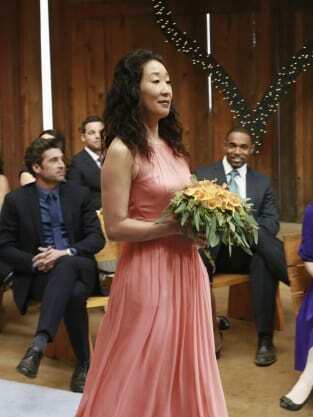 It was hilarious that both Cristina and Meredith asked April if she was bailing on her own wedding. We know why they asked. April, go watch Grey's Anatomy Season 3. How incredible was Justin Chambers as Alex in that intense scene with his father?! He totally brought his A game. Be sure to check out the Grey's Anatomy quotes to rehash Justin's unforgettable performance. I've said it before and I'll say it again. I absolutely love Jolex! How cute were they outside the barn? She makes Alex happy and he really deserves her. April gave away butterflies in boxes as wedding favors. That's brilliant! Forgive me but I'm in total wedding planning mode currently. Don't forget to return next week to pull up a chair and chime in on our Grey's Anatomy Round Table. Overall, I thought that "Get Up, Stand Up" was good but not great. It gave us a slew of storylines to look forward to for the second half of this season. For that, I am thankful. There's much to discuss between now and the show's return in February. Yes, you read that right... FEBRUARY! So, comment away and share what you thought of the winter finale. What did you like or dislike about this installment? What are your predictions for the remainder of the season? Will April run off with Jackson? What do you think is in store for Derek? Have Cristina and Meredith made up?